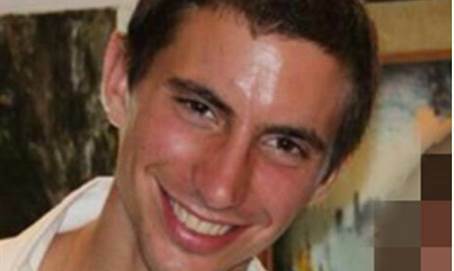 August 1, 2014 - Dr. Simcha Goldin, father of 23-year-old Second Lieutenant Hadar Goldin feared kidnapped in Gaza, spoke to reporters outside his Kfar Saba home on Friday. "We want to give strength to the IDF and the State of Israel in its battle against Hamas in Gaza, and we are sure that the IDF will not stop until they look under every rock in the Gaza Strip and bring Hadar back safe and sound." Goldin was born and raised in Kfar Saba and attended Bar Ilan elementary in the city. He has three siblings - Ayelet, Menachem, and his twin brother Zur, a combat officer. His father, Dr. Simcha Goldin, is a professor in Tel Aviv University specializing in Ashkenazi Judaism. The security event occurred around 9:30 am – more than an hour after the start of a UN-sponsored humanitarian ceasefire. According to a senior military source, one terrorist emerged from a tunnel in the southern Strip and detonated himself near an IDF force, at the same time it is likely that 2nd Lieut. Goldin was abducted. The security incident claimed the lives of an officer and a soldier from Givati Brigade – Major Benaya Sarel and Staff Sergeant Liel Gidoni. Following the event, the IDF launched an intelligence campaign to locate Goldin. At the same time the IDF began firing on the area; Palestinian sources reported dozens were killed by artillery fire in the area of Rafah.